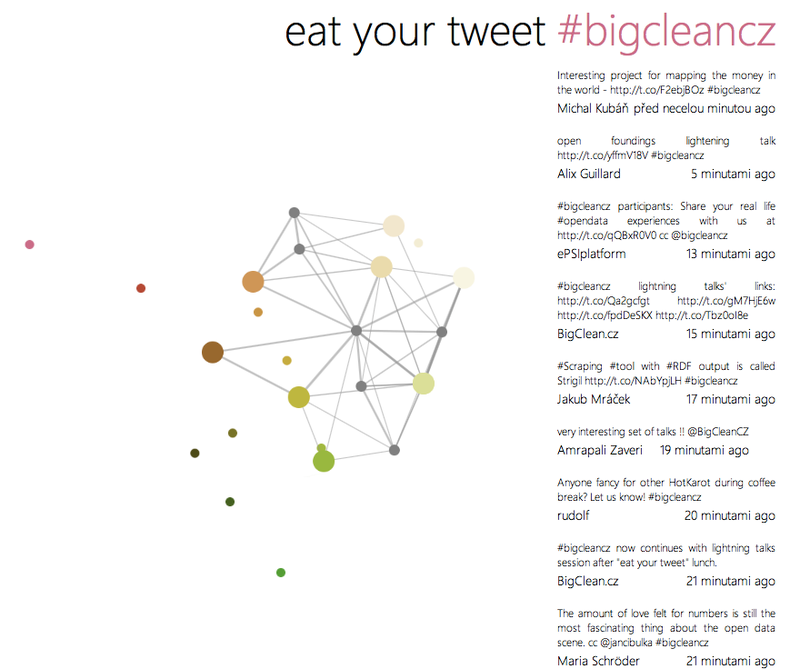 Eat Your Tweet was originally conceived for the sake of BigClean conference Prague, which was focused on the recycling of public sector data into an open data. We were invited to feed the conference attendees in whichever way we want (preferably with some hot carrots and sauce of course) and accepted this fair and generously open assignment quite happily. Right from the beginning it was pretty obvious to us that those data-guys probably wouldn’t be hungry for some techno-emotional snack made from colours or sounds. After some time of heavy contemplation, it occurred to us those kinds of conferences are usually eagerly promoted on twitter, and the participants are diligent to fill their twitter streams with fresh news from the lecture hall, as well as gossips overheard near the coffee machine. And that’s a nice source of data! So, to put it short, we decided to cook the OpenSauce from all tweets that would be produced under the unique conference hashtag #bigcleancz, and let the participants to literally swallow their words back. We called that Eat Your Tweet. It worked like that: we were sampling the tweets for some time before the conference started and during the event’s morning, then we compiled them into one text and performed a network text analysis that resulted in an extraction of six final sauce ingredients. To make this happen, we used a text visualisation technique that permitted us to browse through a content of a given text corpus, and extracted single text units (words) based on their mutual relations (words‘ proximity). By folding the linear text into a network of interconnected words, this technique provided an alternative view on the text and enabled us to translate it into a sauce. We basically visualised normalized textual data as a network graph of a sauce recipe, where each node represented a single ingredient. The translation of the node into the unique ingredient was performed through mapping of the graph onto the colour spectrum wheel, where each node assumed a certain position defined by particular colour frequency. Going back to our OpenSauce recipe feature, where each colour frequency matches a particular ingredient, we were finally able to translate the whole graph into a sauce. The ultimate #bigcleancz tweet recipe was born. Najs, right? Although we created the recipe out of usual textual input at that time, the idea of arbitrary data cuisine was basically included again, as the source text of the recipe didn’t include any information about food at all (ok, it actually did, as some of the participants who were aware of our experiment posted tweets like: „cheese, I want a cheese in the sauce!“ or „pepper pepper add pepper“..which was obviously biased, as the proximity-based text analysis doesn’t take the contextual semantic meaning into an account). Another funny part of the Eat Your Tweet concept was that everyone who was tweeting, automatically became a part of the collaborative recipe creation – no matter if they wanted or not. Cooking basically became a byproduct of other daily activity there. Ok, this is quite a long description, let’s just put it simple: Eat Your Tweet is based on the idea that you are what you eat, you are what you tweet, and… you eat what you tweet. Btw. here is how it looked like at the Big Clean event. Here you can even try to make a tweet-sauce on your own.